Hope you like this topper and mat, thought it might come in handy for Mother's Day. 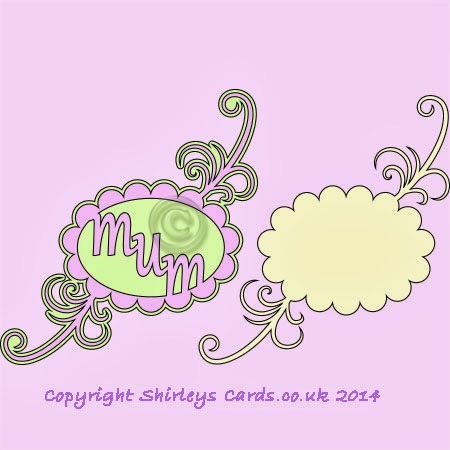 There is a blank version of the topper without the word Mum as I know not all of us are lucky enough to still have a Mum. Your flourish is beautiful Shirley.Thank you for sharing. Tanks a lot your file is pretty. Thank you so much for sharing all your beautiful designs. They are stunning! I hope that I might be able to use a few of them, since I think I downloaded them all!. I really appreciate your generosity. thanks Shirley for this lovely flourish. My Mum will love it! This is really lovely, perhaps I'll make a card for my Son to give to me LOL. Lovely design Shirley, love the scrolls, it would have gone to my Mum., it would have been perfect for her, Thank you. Lovely!. Thank you for sharing. They are fab Shirley ....i will have to get my Silhouette machine out. Thank you! Thank you for this freebie Shirley. I have just discovered your blog. Thanks for making a blank version. I lost my Mom, sad to say.